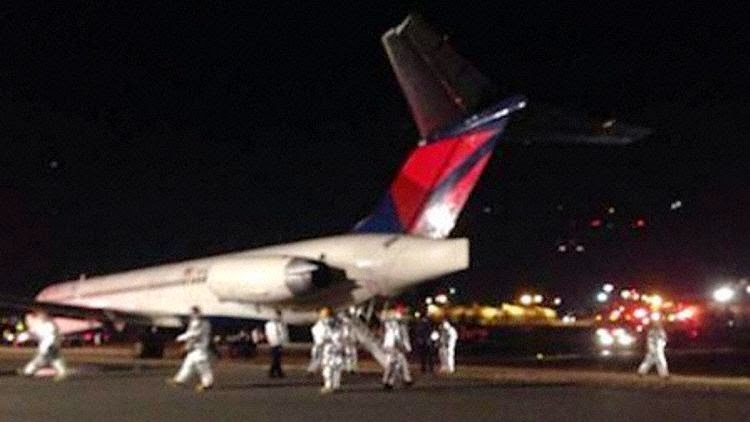 A Delta Airlines McDonnell Douglas MD-88, registration N992DL performing flight DL-886 from Atlanta,GA to New York La Guardia,NY (USA) with 118 passengers and 5 crew, was descending towards New York when the crew reported a hydraulic failure and decided to divert to New York's JFK Airport requesting runway 31L (length 14,572 feet/4,442 meters). The crew indicated they had lost all hydraulics fluid, had no brakes whatsoever, the gear doors would be open due to manual gear extension and they had no nose gear steering. JFK Tower advised emergency services that runway 31L (runways 22 active) was reserved for the emergency and would be closed as soon as the aircraft landed, they were cleared to proceed to assist the aircraft as needed after landing. The aircraft touched down and slowed on the runway, the crew requested chocks repeatedly stating they had no brakes, both engines were shut down, fire brigades told the crew they would apply chocks as soon as the aircraft came to a stop. The aircraft went off the runway at low speed and came to a stop with all gear on soft ground. The passengers disembarked normally via the rear stair of the aircraft and were bussed to the terminal. The airline confirmed a hydraulic problem prompted the crew to divert to JFK Airport due to the longer runways available. While taxiing to the gate the aircraft exited a taxiway.